I *love* Audrey Hepburn and 'Breakfast at Tiffany's' -- it's one of my favourite all-time celluloid gems! 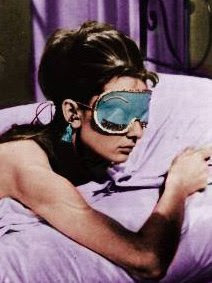 Keeping in the spirit of the movie's gal about town, Holly Golightly, get a glimpse of this retro-tastic sleep mask. Identical to the version that "Holly" employs to help send her off into sleep, you'll be counting sheep (or images of George Peppard) in no time! People need masks to sleep? Weird. I wonder what it tastes like. Oh wow! That's so cool. Quincy... you are so lovely! I'm getting my Schipperke baby on Friday.